When a man enters a mosque armed with weapons and targeting Muslim men and women in prayer, it is an attack not just on the Muslim community, but an attack on all peaceful people. This was the message delivered by Aurora Imam Refaat Mohamed to nearly 200 people filling the gymnasium at the Aurora Family Leisure Complex on Sunday evening. They represented all faiths and all walks of life, but they came together with a single purpose: to hold vigil for more than 50 members of the Muslim faith killed in shootings at two Christchurch, New Zealand mosques last week. Imam Mohamed, leader of the Albrar Muslim Association on Edward Street, was joined at the vigil by leaders of the Jewish and Hindu faiths, Councillors Wendy Gaertner and Rachel Gilliland, former MPP Chris Ballard and representatives from other local leaders, where he shared a call to action in the face of tragedy. Speaking directly to the community leaders in attendance, including members of the York Regional Police, Imam Mohamed asked officials to “open an eye” to hate and be conscious of people who “are actually fulfilling their agenda of killing innocent people. their attacks and we urge our officers, authorities, intelligence and security [to] look into the social media of those individuals who are actually spreading hate and planning…and saying what they are going to do (online) ahead of time. There was also a message of defiance, one of keeping Mosque doors open to anyone at any time, for people to come, gather and pray. 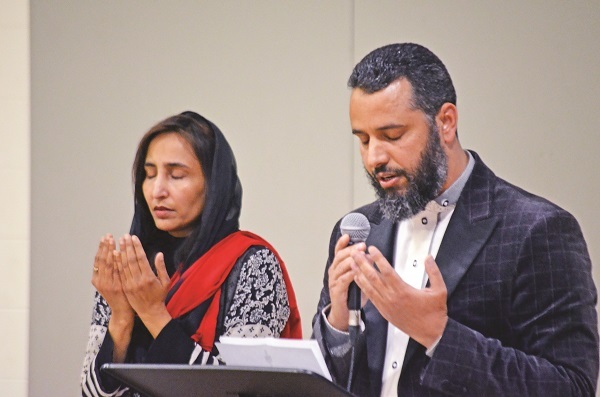 There are many people in this community, he said, who might not be aware of the Albrar Muslim Association, the prayers that take place behind their Edward Street doors, and stepping through would allow for an exchange. “There are people praying, reading the Holy Koran, learning about their faith and learning the Arabic language,” he said, noting the community has grown from Friday prayers of about 10 people in the basement of a local store, to a thriving Mosque of nearly 200 people. “We tell our brothers and sisters we’re not scared and the Muslim community is not scared to go to a mosque, and the kids are not scared for one reason: we live in Canada, which is a blessing from God to us that we are selected to live in such a beautiful Region. We are proud that York Region is one of the safest in the whole world. These words were echoed by Peter Ginsburg, representing the Jewish community and Newmarket’s Or Hadash. “If you took a look at press coverage from around the world you’re going to realise something: the white supremacists have lost; they just don’t know it yet,” he said. “All across Canada, all across the world, ceremonies like this one are being held in every synagogue, in every mosque, in every church, in every temple. In Australia, a group of surfers held a paddle-out ceremony. They go over to the ocean, they form a circle, they observe a minute of silence, and they place flowers in the water to honour the victims of the mosque shootings. In New Zealand, a biker gang of Maori show up and perform a Haka dance, a warrior’s dance, which is their way of honouring the victims.